1966 Gordon and Smith, Bobby Brown/Floyd Smith 9 ft 3"
11 3/4" x 7 1/2" base. Not the original fin, but a copy. 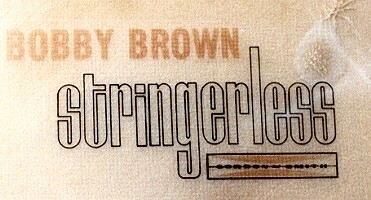 Bottom: small large "BOBBY BROWN" red (faded), "stringerless" black text and small "Gordon and Smith" red/black rectangle - in nose concave. Image left. Deck: Paul Cole 8683 (pencil on tail???) - shaped for. The original fin was lost in 19xx? at Coolangatta Queensland? 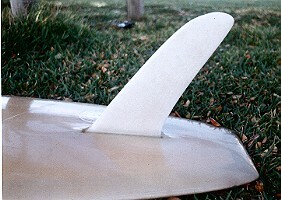 but was replaced with one based on the template of a similar board/fin. Photographs : DV8s Old Mal Rally, April 2001. Thanks to Bill Morris. 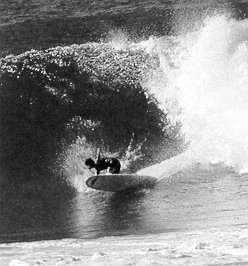 The board design was given positive exposure with publication of a series of photographs by Jack Eden, published in his Surfabout magazine, circa 1967.The photographs of Bobby Brown's dynamic surfing at 8ft plus Sandown Point only further enchanced his considerable reputation, see example below. Bobby Brown passed away in 1967. 1. Black Bobby Brown decal does not indicate the board was shaped by Bobby Brown. 2. Concave section is an unusual application and does not cornform with current concave flow theory. 3. Floyd Smith was an original partner in the US company who travelled to Australia and formed the Australian company at Caringbah, circa 1965. 1. Margan and Finney pages 219, 232 - 233, 236 - 237, and others.See below. 2. Bobby Brown is featured in The Hot Generation, Parts 2 and 5. Printed in colour Margan and Finney page 232.